Despite what you and I prefer, the world turns and the seasons change regardless of our ideas on the topic. It is interesting to talk to people about the weather this time of year. I am the one excitedly pointing out the changing leaves (everywhere) and cold nights, and at least 70% of the time the other person is lamenting the end of summer. I've learned to cope with summer in the Adirondacks, so I figure the lamenters should get use to early and long winters if they live here; it is part of the Adirondack Lifestyle. Part of Fall in the Adirondacks is getting ready for winter. Jay and the talented folks at Whiteface Mountain, the site of the 1980 Olympic Winter Games alpine events, are doing just that. 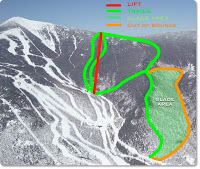 They are making a new section of trail called "Lookout Mountain" with lots of new glade skiing. This is jump up and down news for some of us aging Adirondack back country skiers; more lift-serve tree skiing! It sounds like the trails will be ready this winter, with snow making and all. I enjoy every lovely day, but it is always fun to think about snow.